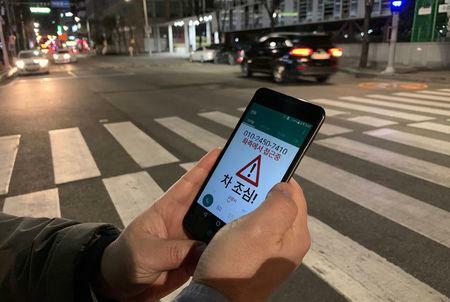 ILSAN, South Korea (Reuters) - A city in South Korea, which has the world's highest smartphone penetration rate, has installed flickering lights and laser beams at a road crossing to warn "smartphone zombies" to look up and drivers to slow down, in the hope of preventing accidents. The designers of the system were prompted by growing worry that more pedestrians glued to their phones will become casualties in a country that already has some of the highest road fatality and injury rates among developed countries. State-run Korea Institute of Civil Engineering and Building Technology (KICT) believes its system of flickering lights at zebra crossings can warn both pedestrians and drivers. In addition to red, yellow and blue LED lights on the pavement, "smombies" - smartphone zombies - will be warned by laser beam projected from power poles and an alert sent to the phones by an app that they are about to step into traffic. The multi-dimensional warning system is operated by radar sensors and thermal cameras and comes with a price tag of 15 million won ($13,250) per crossing. Drivers are alerted by the flashing lights, which have shown to be effective 83.4 percent of the time in the institute's tests involving about 1,000 vehicles. In 2017, more than 1,600 pedestrians were killed in auto related accidents, which is about 40 percent of total traffic fatalities, according to data from the Traffic Accident Analysis System. South Korea has the world’s highest smartphone penetration rate, according to Pew Research Center, with about 94 percent of adults owning the devices in 2017, compared with 77 percent in the United States and 59 percent in Japan. For now, the smombie warning system is installed only in Ilsan, a suburban city about 30 km northwest of the capital, Seoul, but is expected to go nationwide, according to the institute. Kim Dan-hee, a 23-year-old resident of Ilsan, welcomed the system, saying she was often too engrossed in her phone to remember to look at traffic. "This flickering light makes me feel safe as it makes me look around again, and I hope that we can have more of these in town,” she said.